Frenzied finger-picking, dueling croons and high drama set to free-spirited pop progressions: these are the components that go into defining any given Avett Brothers record. Be it the remorseful poetry of 2006’s The Gleam or the sweeping anthems we’d last heard from them with I And Love And You, Scott Avett, Seth Avett, Bob Crawford and Joe Kwon together continue to strike a balance between traditional country sensibilities and the rock and roll of tomorrow with The Carpenter. Though they’ve always played to the beat of their own kick-drum (quite literally, as Scott frequently double-fists one and a banjo live), I And Love And You was a watershed moment for the Concord, N.C. quartet in that they broke away from their typical banjo-guitar-upright bass-cello arsenal, rolling out a piano for the big numbers and plugging in for the fast ones. With The Carpenter, we’re reminded of the stripped-down, rebellious arrangements of Avetts records past—Emotionalism, Mignonette—more than we are their more recent, grandiose compositions, those that scored them supporting gigs for Dave Matthews and a “Maggie’s Farm” sing-along with Dylan himself at the 2011 Grammys. 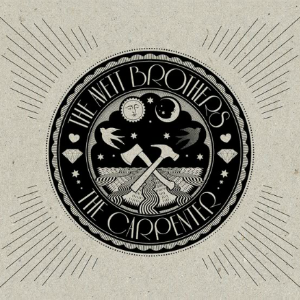 The Carpenter provides a return to rudimentary Avett songwriting, in that the most striking moments on the record are born from playful banjo-guitar banter and confessions revealed in 4/4 time. Lead-off track “The Once and Future Carpenter” and “Live and Die,” Carpenter’s first single, best exemplify the former, seamlessly weaving Scott and Seth’s bright harmonies with tinny scales and joyful steel-stringed bursts. “Let her heart beat change what I am now” set to the gorgeous, haunting low of Kwon’s cello is a stanza strong enough to break your heart in two at the height of “Life,” and the solemn notes of “Through My Prayers” demonstrates the Avetts’ ability to delicately address universal, frightening themes while delving a little deeper than your typical ballad in rock and country. It’s this penchant for playing with contrast—between light and dark, comedy and tragedy, hard and soft, fast and slow—and their ease with switching gears between the romps and soliloquies that shines on The Carpenter, perhaps stronger than on any of their previous releases. And as monumental as I And Love And You was for the them, a return to their roots for the Avett Brothers only reinforces what we already knew: a banjo lick and a boot-stomp can go a long way, and to move forward you need to take a step back, sometimes, and remember where you came from.